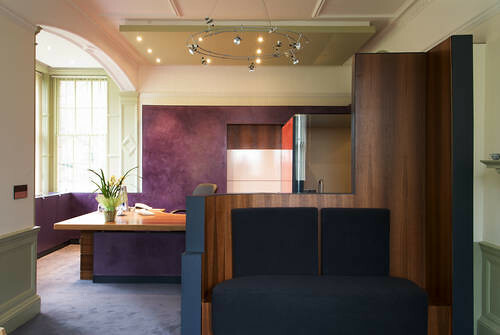 Richard Murphy Architects were formally appointed to design a new suite of offices for the Vice Chancellor of Napier University in August 2005. This followed on from a number of earlier feasibility studies the practice had undertaken before a suitable location was found in the west wing of the Listed New Craig Building on the University's Craighouse Campus. The building was originally constructed in 1890-4 to designs by Sydney Mitchell and was formerly the Royal Edinburgh Hospital before becoming part of the University in 1993. 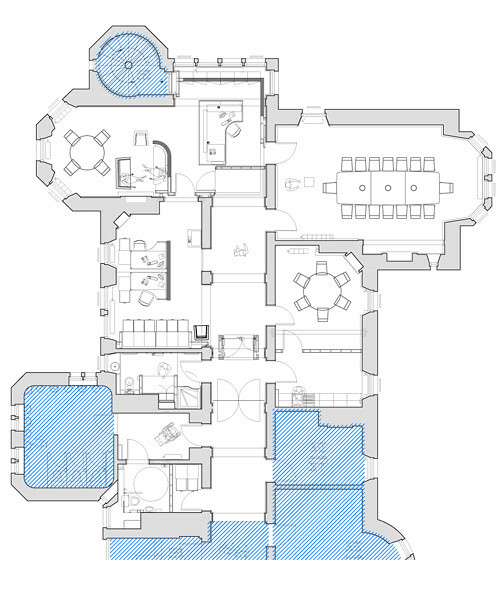 The office of Vice Chancellor required a suite of rooms that were in close proximity and in some cases interlinked to provide the following areas: conference facilities, private dining, kitchen, private shower/wc, administration offices for a PA and Secretary and file storage. 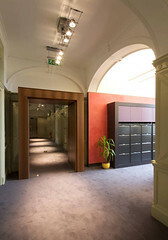 Together with these, a large private office space was needed by the Principal herself, which was also to have a meeting facility. 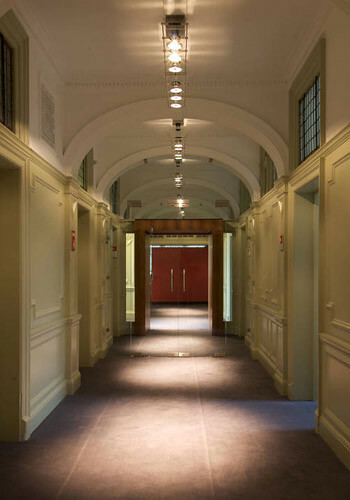 The staff also required the ability to access the offices directly from outside rather than a circuitous route through from the main entrance. Following consultation with Historic Scotland, a scheme was proposed to limit the amount of removal of listed interior fabric. More recently sub-divided spaces were remodelled to form larger open plan spaces. To ensure security and privacy, the floor of the wing was altered to provide a single means of access (escape). 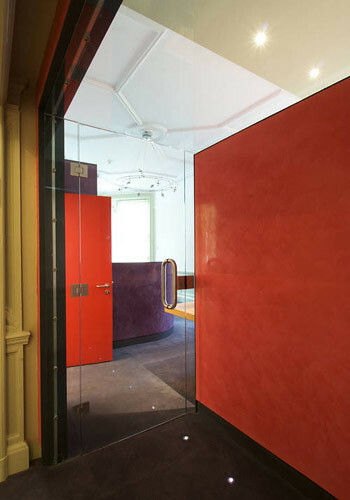 A new fire lobby enclosure was thus formed to the existing main stair to both reduce the escape travel distance, but also to architecturally signify the entrance to the office suite. New wall insertions into the space have been, in most cases, deliberately been placed to be free from the existing walls. 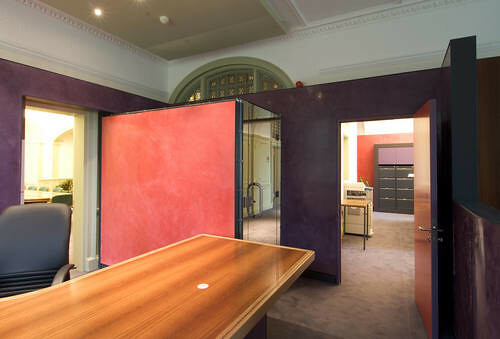 The new feature walls are given either a polished plaster or brown oak veneer finish together with a hard steel edge to ensure their visual separation from the existing fabric of decorative plaster cornice and timber dado panelling. 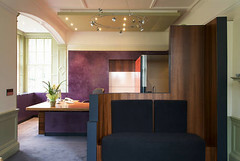 The existing walls were given a neutral, period colour scheme. 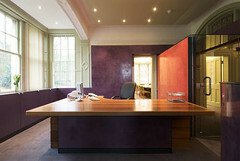 Within the Principal's office itself, a new desk has been designed to incorporate various IT and filing functions. From behind her seat, a sliding panel gives access directly to the conference room. New polished plaster walls wrap around her desk to define the space. These then wrap in front of an adjacent window to provide a storage space and also down to the existing fireplace to form a fixed seating area. The project was completed in April 2006.